Serial technology entrepreneur turned business angel Kevin Grainger was the latest successful business person to share ‘My Story’ with members of St Andrews Business Club at its December breakfast meeting. The element which stood out in all his ventures since he started his first company 19 years ago was his passion for science and technology. After graduating from St Andrews University in with a Physics degree (as well as meeting his wife there), Kevin switched to the field of software and worked at Ferranti on the Tornado jet’s navigation system before moving to Newell & Budge, where his skills in sales and marketing were used to great success for many years. In the summer of 1996 Kevin took the decision to set-up Company Net – www.company-net.com – with Neil Francis. They’d identified the opportunity and value in database-driven websites and quickly grew it into one of Scotland’s most successful e-business consultancies. Kevin was responsible for the technical direction of the business as well as generating sales and managing major accounts. Within two years of setting it up, Kevin and Neil sold 75% of the business to their biggest client, Burmah Castrol, in a cash deal. When Burmah Castrol was subsequently acquired by BP in 2001, the pair regained control of Company Net via an MBO backed by Edinburgh-based venture capital house, Caledonian Heritable Investments. It later exited the business. In 1999 Kevin established a ‘spin out’ from Company Net called The Knowledge Business – to sell and support a unique e-learning software package, initially developed for one of Company Net’s clients. Kevin grew The Knowledge Business over the subsequent years and it has recently been reintegrated into Company Net as its eLearning business practice. Over his final years at Company Net, Kevin worked on a part-time consultancy basis as an eLearning Account Manager responsible for its largest customer, the NHS. Over a period of six years he oversaw the introduction of one of the largest national e-learning programmes in Scotland, predominantly aimed at the prevention and control of Healthcare Associated Infections (HAl). Kevin and Neil sold Company Net to its employees five years ago. It continues to develop and thrive and is one of those rare beasts – a profitable Scottish internet software business as well as a UK Microsoft Gold Partner. In the world of bricks and mortar, Kevin has built up and manages a commercial and residential property investment portfolio invested in Fife and Edinburgh. 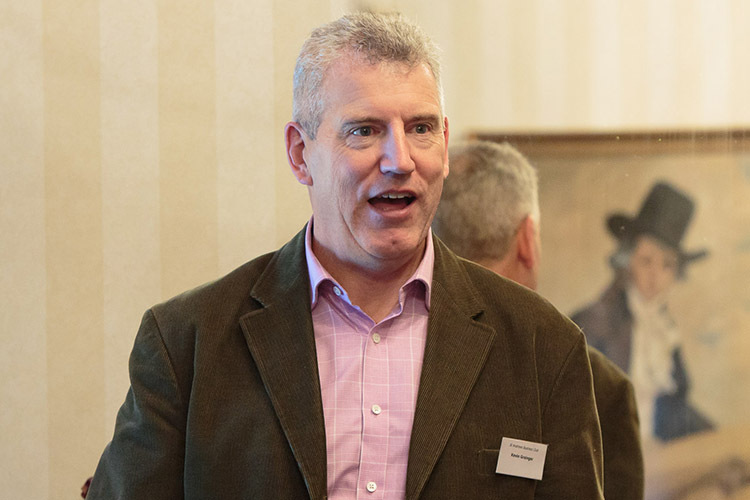 Most recently Kevin has established the EOS Technology Investment Syndicate in St Andrews with the help of Club President Alistair Lang and local ‘business angels’. It has invested in three high-growth start-up businesses. Kevin has also taken on a number of non-executive positions with technology companies with aggressive growth targets. Speaking about the world of angel investing, Kevin explained that investors are typically looking for “big exits” of at least 10 times the value invested in return for taking on the high risk nature of the investment. People – who understand their market and product intimately and with whom investors can enjoy good rapport. Product – the right product at the right time. Kevin gave the example of the Sinclair C5 as the right product at the wrong time. Potential Market – this needs to be globally scalable. Potential Exit – ideal ventures should have identified their potential exit as well as growth strategy. Kevin added that good legal advice on issues such as intellectual property (IP) and legal structure is critical. Asked what he enjoyed most about what he does now, Kevin said the variety of businesses he now works with. Members showed their appreciation in the usual manner.